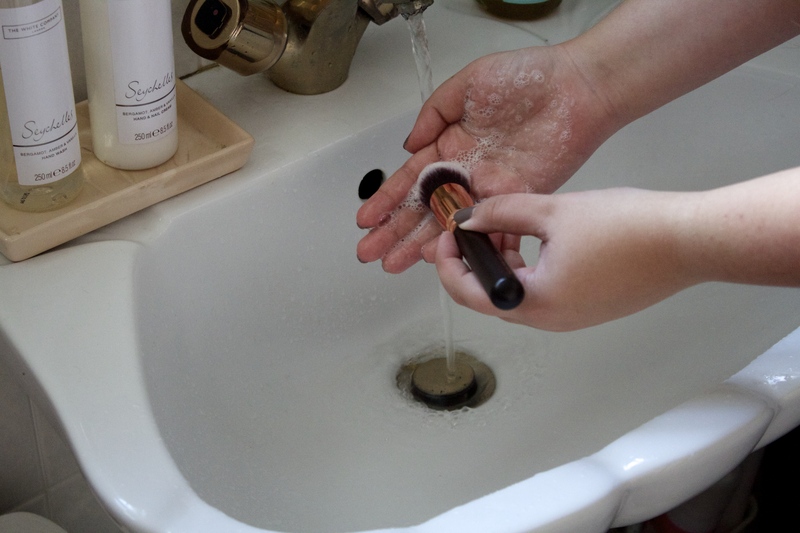 I know this is probably common knowledge to most people, so why bother doing a post about cleaning your make-up brushes? Well in actual fact, its surprising the amount of people that leave their brushes to build up with all their make-up and gunk. So if this post does anything, it could just be a gentle reminder to go and clean that brush that you put on your clean skin every day! It is so important to clean your brushes regularly, especially ones you use to apply your base with (foundation, BB cream ect. ), because otherwise they will harbour nasty bacteria and could be the reason for an unexpected breakout! I do feel though, that I have a couple of nifty tricks up my sleeve which- as far as I’m aware- haven’t been widely shared on the world wide web. So firstly, you should always clean your brushes with the most gentle of liquid soaps- things like baby shampoo’s because they are made to use on fragile hair. But I’m sure you already knew that one. However convenient and easy the solutions like MAC’s makeup brush cleanser are, they basically only do half the job for you at probably three times the price! Also, don’t forget that there could be plenty of harsh chemicals in that solution and you’d essentially be putting that on your face. So I ask that you say to yourself- ‘would I put this stuff on my skin?’- if no, then don’t use it to clean your brushes! I personally use the Dr. Bronner’s Magic Soap which is made using pure castile soap, so that means it is completely organic (as recent culture demands such hipster and trendy things like this). I’m currently using the baby mild version which is (supposedly) free from scent. However, I can vouch that this one does have a bit of a pong- the best way for me to describe it would be an old fashioned soapy suds scent, like the smell of a freshly washed Queen Victoria (or so I like to imagine). You do genuinely get past the scent once you’ve used it a few times but for those that are a bit scent obsessed and like a nice whiff, Dr. Bronner do some other lovely scent’s in this castile Liquid soap; the baby mild one is just the most gentle for your brushes. 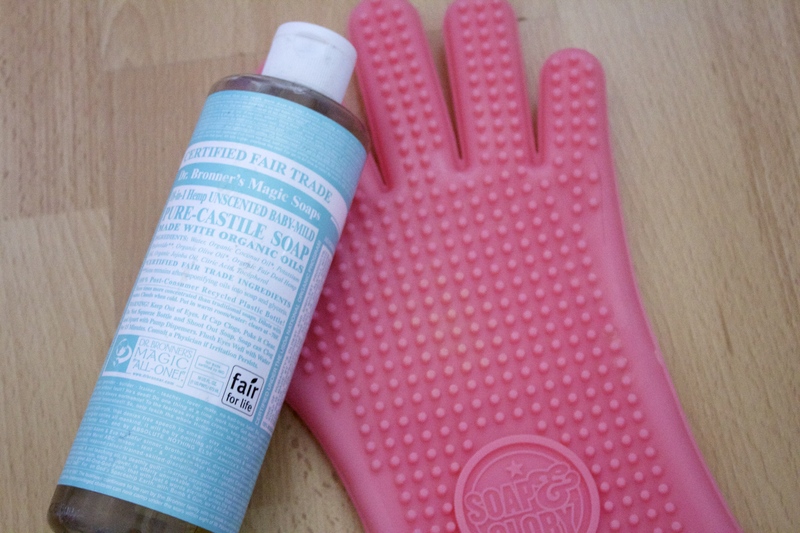 So usually, I’ll clean mine every two weeks (depending on how manky they are), and alongside the Magic Soap I will occasionally use a silicone exfoliating glove to deeply clean the brushes that are very grimey. The one I’ve got is by Soap and Glory and was honestly so affordable; I found a brand trying to market ones like these as genuine brush exfoliators and wanted thirty pounds for one glove! I will often just use the glove for my foundation brushes, as they are the ones that need a deeper clean. 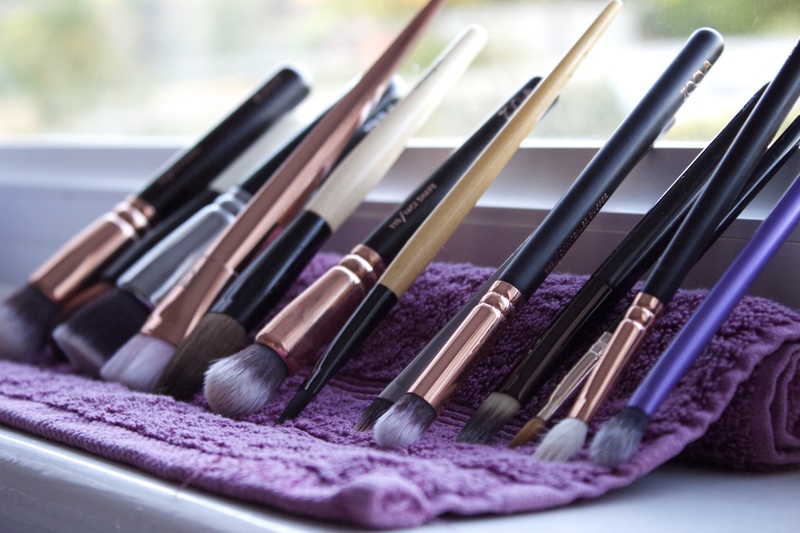 It is so easy to give your brushes a clean. Simply pop some soap into the palm of your hand, dampen the brush head first under luke warm running water (I repeat, luke warm water!) and gently swish it around in your hand- trying not to press it down too hard as you will cause the soap to seep up into the base of the brush, where the glue is! After its all nice and restored to its former glory (and this may take a couple of washes, depending on how clean it was to begin with), you just want to squeeze the brush in a downward motion to wring out all the water- kind of like washing your hair! Now, a handy tip for when you dry your brushes- that I absolutely swear by- is to roll up something like a dry flannel or small hand towel so it’s got a nice roll at the top end. Then you can lean your brushes up against it, so that while they dry, you’re also not risking any of the remaining water reaching the glue inside the brush handle. This is vital, because as soon as this happens your brush sheds like nothing else! I pop mine in the windowsill of my bedroom so that they’re out of the way to dry over night and so that they also get a bit of sun in the morning which helps them to dry further.